We have come to an end to the year 2011 and I think you all had a fantastic and satisfactory year in 2011. 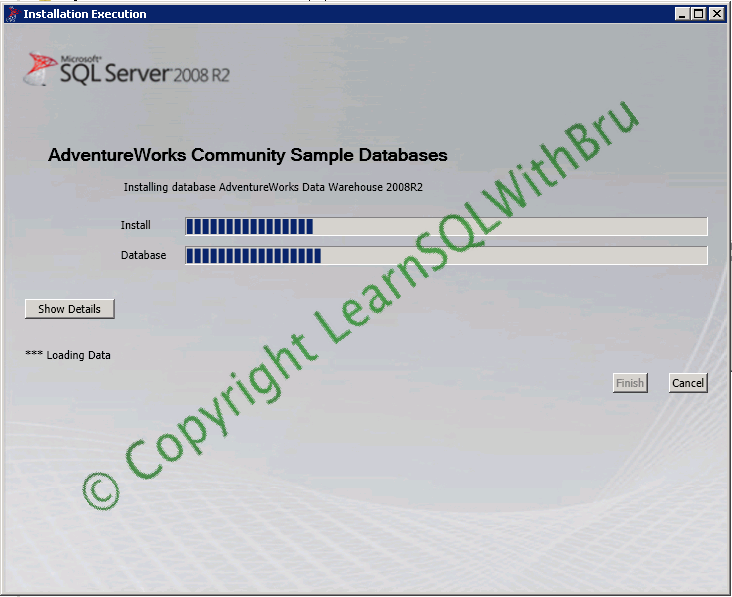 I wanted to look back and see what the year 2011 was to me both personally and professionally in SQL Server. In terms of SQL Server, I attended PASS Summit for the first time, which has been my 3 years wish. I started using SQL Server 2012 since CTP 3 ( was called Denali). I had a fabulous year in 2011 especially in the last quarter of 2011 was much involved in writing blogs @ LearnSQLWithBru.com. Overall I wrote 58 blogs in 2011 (excluding this bog) out of which 52 were in the last 3 months, that shows how busy was it. Personally I was happy to achieve one of my long term passion, “Become a better Tennis Player” and I think I definitely achieved this by playing way better than how I played in 2010 (which was my first year of playing Tennis). I also joined USTA and played one tournament in NTRP 3.5 level and currently playing a winter mixed doubles league at a local club. I wish to continue improve my Tennis game and be a better player in 2012. I am going to write a list of my goals for the year 2012 tomorrow (Jan 1st 2012), so lets see what are those goals and how I will fare against those at the end of year 2012. The first step is downloading the sample database. Visit the Microsoft Database Product Samples website and choose the sample database for the version that you want. 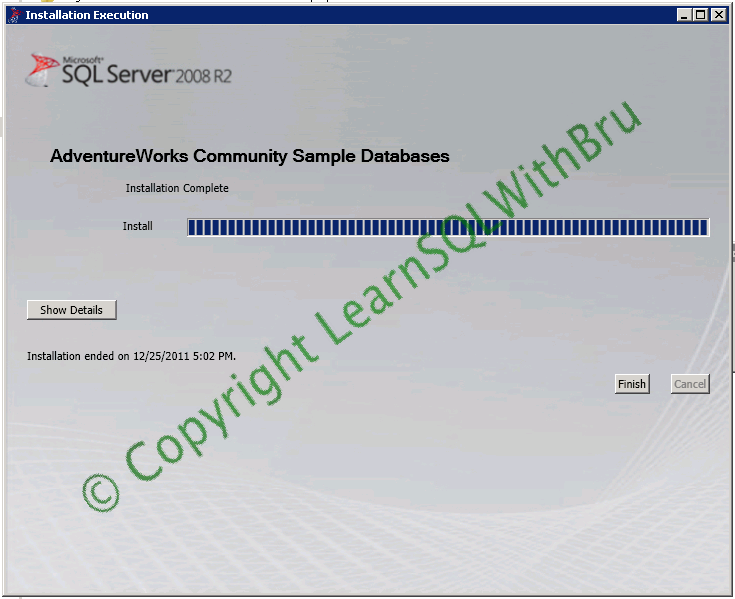 Since we are dealing with SQL Server 2008 R2 he is the link. Once you have downloaded the file (approx 80 MB). Go to the location where the downloaded file is residing. 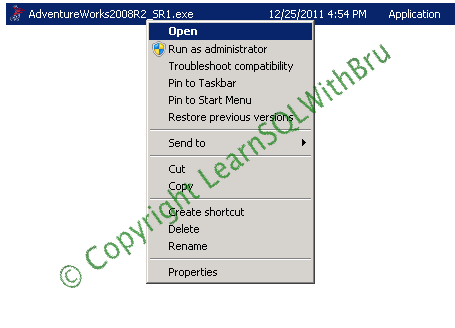 Right click on the file AdventureWorks2008R2_SR1.exe (if you have not renamed it) and select Open; you can also double click on the file. 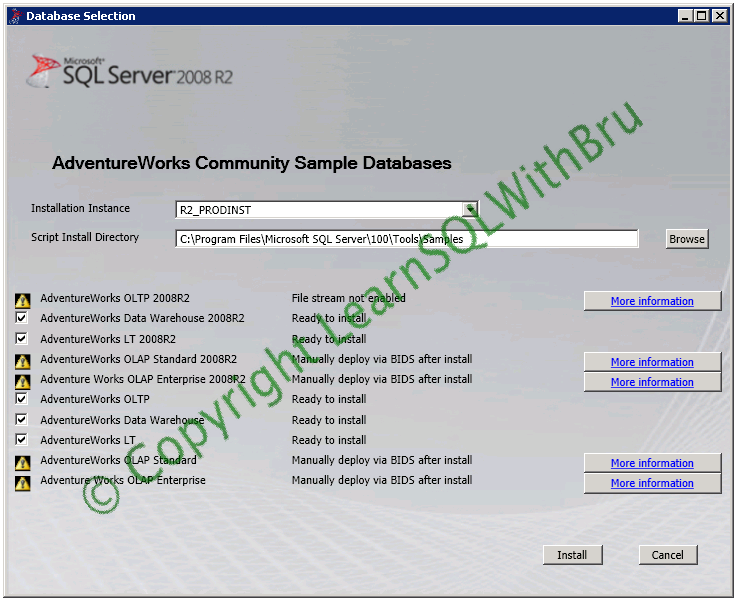 The exe file starts extracting to a temporary location on your local drive and once the extraction is done, the SQL Server 2008R2 SR1 Database Installer is displayed. The below screen is the first screen in which you have to accept to the license terms. Choose the check box and click Next. In the next screen, it will displays on which database Instance the Sample databases will be added. If you have multiple instances on the machine, you can choose the Instance name from the drop down list. Note that for some databases there are warning (yellow triangle with exclamation) icon being displayed, those databases cannot be installed through this installed but they can be added manually using Business Intelligence Developer Studio. You can click more information to find details on how to perform that task. 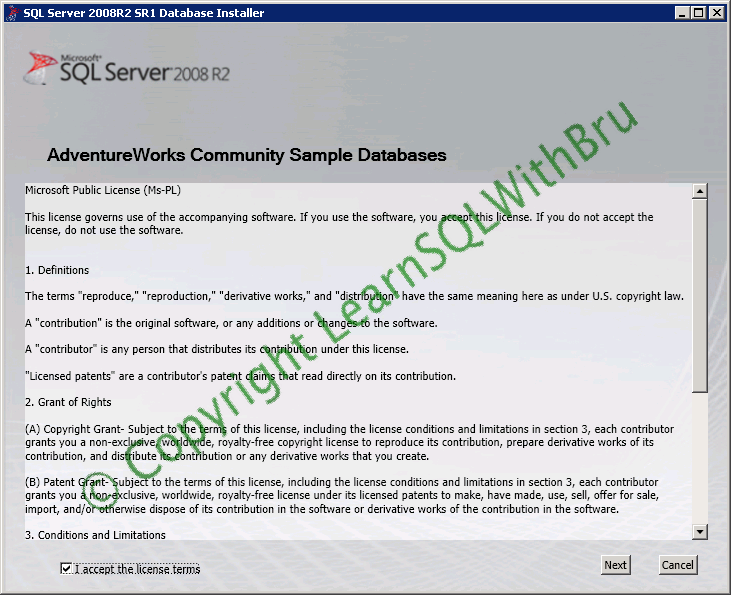 The installation of sample databases progress is displayed, you can click Show Details button to view the detailed information in text format..
Once the installation is done, the progress bar indicates that installation is complete.. Click Finish to close the Installer.